Thanks to its turbocharged 4-cylinder engine, the Santa Fe Sport 2.0T has no problem in the get-up-and-go department. Not too big and not too small, the Hyundai Santa Fe Sport 2.0T is an attractive, practical, and fun-to-drive crossover SUV that appeals equally to the left and right sides of your brain. While the interior could use a cosmetic overhaul and the thrilling turbocharged engine gets thirsty, the main reason to consider an alternative has to do with safety. Hyundai needs to kick it up a notch in a critical new crash-test evaluation. Hyundai takes a two-pronged approach to building a midsize crossover SUV. The Santa Fe is the larger of the two available models, equipped with seating for up to 7 people and a V6 engine. The Santa Fe Sport is the smaller version, featuring 5-passenger seating and a choice between two 4-cylinder engines. This review pertains to the Santa Fe Sport. Redesigned just a few years ago, the Santa Fe Sport receives a number of enhancements for 2015. Most important among them, engineers have re-worked the steering and suspension tuning in order to make the SUV more enjoyable to drive. Additionally, a new Smart Tailgate feature debuts, one that is genuinely handy when your own hands are not. As was true last year, the Santa Fe Sport is offered in regular-strength and turbocharged formats, each with an optional all-wheel-drive (AWD) system. Upgrades are available in the form of option packages, and dealers can install a handful of additional accessories. Prices start at just below $26,000 and can rise to nearly $40,000 with every single option. My test vehicle was well equipped—a turbocharged 2.0T with Limited trim, the Ultimate Package, and a set of floor mats—the window sticker reaching a grand total of $36,620 including the $895 destination charge. The Ultimate Package includes a set of 19-inch aluminum wheels, and they look terrific, giving an already attractive SUV even more road presence. 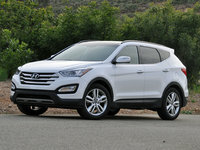 Hyundai has done an excellent job with the Santa Fe Sport’s styling; I wouldn’t change a thing about it. 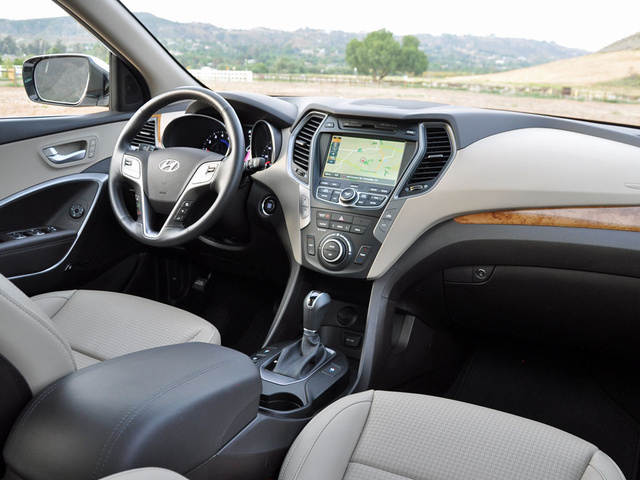 Inside, the Santa Fe Sport’s design isn’t quite as cohesive, especially in the Beige color. The mix of colors, shapes, and textures is visually jarring, and the tan dashboard throws a significant amount of reflection onto the windshield on sunny days. The light-colored, simulated wood trim looks dated, too, though the quality of the interior materials impresses in many respects. While the cabin could use modernizing in terms of its appearance, the Santa Fe Sport is nevertheless an appealing choice in a 5-passenger crossover SUV. Thanks to its turbocharged 4-cylinder engine, the Santa Fe Sport 2.0T has no problem in the get-up-and-go department. This is a strong engine given its 2 liters of displacement, rated to make 265 hp at 6,000 rpm and 269 lb-ft of torque between 1,750 rpm and 3,000 rpm. Torque is what you need for quick acceleration and speedy passing, and the Santa Fe 2.0T delivers. Step on the gas from a stop, and it takes a moment for the turbocharged engine to pick up steam, but once engine revs increase, the front wheels threaten to break loose and paint black stripes on the pavement. On the highway, when overtaking traffic, the engine is ready and willing, the 6-speed automatic transmission kicking down a gear or two in order to whoosh the Santa Fe Sport past slower vehicles. With front-wheel-drive (FWD), the EPA estimates that a Santa Fe will return 19 mpg city/26 highway/22 combined. During my testing, the SUV averaged 19.9 mpg. Granted, half of the time I was driving with the powertrain’s Active Eco system turned off, but my number reflects just how tempting it is to dip deep into the Santa Fe Sport’s well of power in order to enjoy the turbocharged rush of acceleration. As far as the changes to the electric steering and suspension tuning go, Hyundai can celebrate improvement, even if the result isn’t perfection. The Santa Fe Sport’s Driver Selectable Steering Mode (DSSM) steering system provides the driver with Comfort, Normal, and Sport settings. Comfort is easier to use, while Sport is calibrated to provide a sense of greater heft. Normal mode is my favorite. Models equipped with the Ultimate Package, like my test vehicle, get a set of 19-inch wheels and 235/55 Continental Cross Contact tires. This sizable rubber, in combination with the SUV’s impressive roll control, allows a Santa Fe Sport to hustle around corners carrying greater speed than you might expect. It’s fun to drive on a twisty mountain road, too, and the brake pedal is easy to modulate in order to apply exactly the right amount of pressure ahead of a turn. Thanks to this year’s suspension changes, the ride quality is also improved. Depending on the size of the dip or bump, the front suspension still demonstrates a momentary delay in reaction, leading to a sense of wooziness and weakness, but the effect is subtle. In other situations, the Santa Fe Sport shows newfound refinement. My test vehicle did not have the optional AWD system, which includes Active Cornering Control technology. Choose this upgrade, and you’d best not be planning to travel much farther off the pavement than the shoulder of the road, given the Santa Fe Sport’s modest approach, breakover, and departure angles. The AWD system is mainly useful in rainy and snowy climates. If you can look past the Santa Fe Sport’s unappealing fake wood trim, the quality of the interior materials meets expectations at this price point. Generally speaking, there is a sense of heft and solidity to the controls, at the same time that the cabin sometimes creaks or buzzes in an unbecoming fashion. In the Santa Fe Sport 2.0T, the driver sits in a comfortable power adjustable seat facing clear gauges flanking a driver information screen. 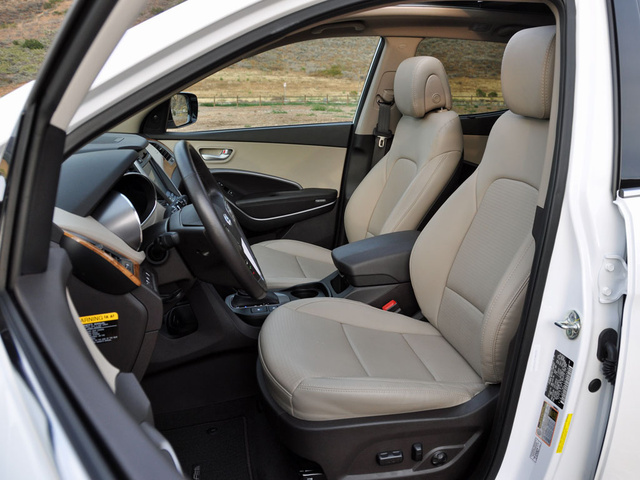 This trim’s automatic climate control system includes Clean Air purification, a nice touch. Leather upholstery and heated front seats are included for the Santa Fe Sport 2.0T, while the Ultimate Package adds a heated steering wheel, heated rear seats, and ventilated front seats. While it would be great if Hyundai could provide greater separation between radio and navigation buttons, the fact is that the switchgear is clearly labeled and owners will eventually get used to how things are laid out. What owners might never get used to is the lack of a seat height adjuster for the front passenger. Adults riding in the rear seat have decent room on a comfortable seat that provides good thigh support. Rear side window shades are standard for the 2.0T trims, and the Ultimate Package contains a huge panoramic sunroof that spans the entire length of the vehicle. It really is quite impressive. 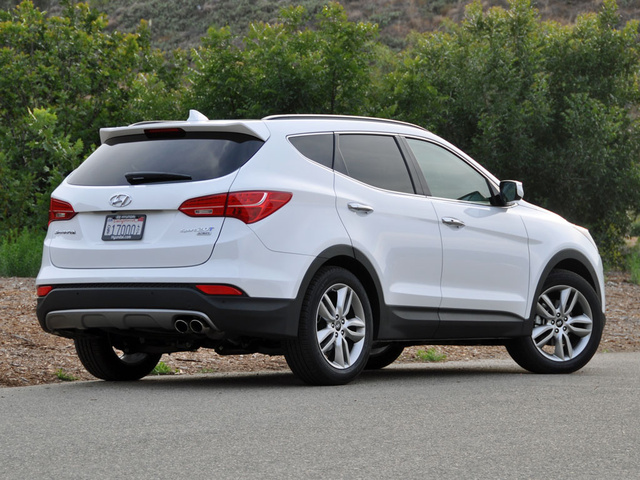 For 2015, a Smart Liftgate is available for the Santa Fe Sport. As long as you’ve got the key fob in a pocket or purse, the power liftgate will automatically open when you walk up to the vehicle with your hands full. If you’d rather not have this feature, you can deactivate it within the driver information system. The cargo area holds up to 35.4 cubic feet of luggage, and because this version of the Santa Fe does not have an available third-row seat, the space beneath the trunk’s floor provides useful bins for carrying grocery bags and other things. 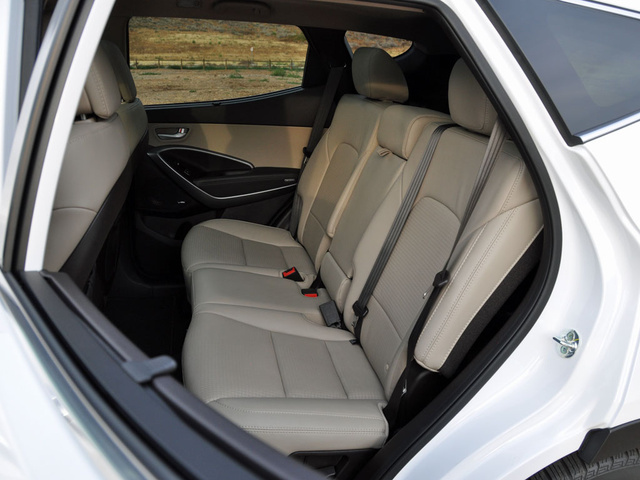 Fold the rear seats to expand space to 71.5 cubic feet, on the small side for what is supposed to be a midsize SUV. Although the standard Santa Fe Sport trims are relatively stripped compared to the more expensive 2.0T trims, nearly everything that’s standard or available for the turbocharged versions of this crossover is available as an option on the standard trims. That includes Hyundai’s impressive Blue Link telematics and services technology. This subscription-based setup offers three levels of service. Connected Care is free for the first year of ownership, and includes the three features you need the most: Automatic collision notification, an SOS emergency assistance button, and enhanced roadside assistance. If you want to continue this service after the first 12 months of ownership, it’ll run $99 per year. Select the Remote Package (free for 3 months, then an additional $99 annually), and Blue Link supplies a significant upgrade in service. This package includes remote vehicle access to unlock the doors or start the engine, as well as an alarm notification system, stolen-vehicle slowdown and recovery, and a car-finding feature that allows the owner to locate the car via a smartphone app. That last service is useful to parents of teen drivers. Additional Remote Package services that are great for moms and dads include Speed Alert, Curfew Alert, and a Geo-Fence feature that allows the SUV’s owner to set and monitor specific geographic boundaries. 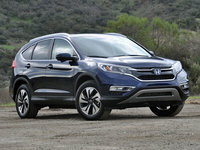 A Guidance Package is also available (you guessed it – $99 per year), but it adds nothing more to the Santa Fe Sport than voice-activated Google destination search, the ability to send search results directly to the vehicle’s navigation system from a remote location, and turn-by-turn directions. With a single exception, Hyundai demonstrates a commitment to safety with the Santa Fe Sport, and refrains from going overboard with features and functions that you really don’t need. In addition to the emergency services and parental-monitoring features of Blue Link, the Santa Fe Sport can be equipped with a reversing camera. In fact, all versions except for the least expensive base trim have one. Hyundai also offers a blind-spot monitoring system, a rear cross-traffic alert system, and lane-change assist technology for the Santa Fe Sport. These features are optional for base trims and standard for 2.0T trims, and work well to help prevent collisions. At one point during my week of testing, I signaled to change lanes, and the lane-change assist system identified a rapidly approaching car within the lane I planned to use, and did so faster than I recognized the threat by looking into the mirror. As far as crash-test ratings go, the Hyundai Santa Fe Sport turns in an impressive performance, with a single exception. In the small overlap frontal-impact test that is conducted by the Insurance Institute for Highway Safety (IIHS), the SUV earns a Marginal rating, making it ineligible for the Top Safety Pick rating enjoyed by the Chevrolet Equinox, GMC Terrain, Nissan Murano, and Subaru Outback. I write this review just as the summer auto sales season is kicking off, and Hyundai dealers are discounting stocks of the 2015 Santa Fe Sport because the 2016 model has just been released. That means Hyundai is offering lease deals, rebates, low-interest financing, delayed-payment programs, and bonus cash offers to consumers. And those help make a Santa Fe Sport a real bargain. Now consider that ownership costs are expected to be relatively low, in part because of the outstanding warranty and roadside assistance programs that protect Hyundai owners. Undeniably, the Santa Fe Sport delivers value. Over time, though, it could prove to be less impressive in terms of cost effectiveness. Especially with the 2.0T trim’s turbocharged engine, it’s not hard to miss official fuel-economy estimates, and ALG thinks a Santa Fe Sport will hold its value over time at no better than an average rate. J.D. Power and Consumer Reports aren’t terribly bullish about this model’s overall dependability, either, giving the Santa Fe Sport average ratings. Still, once Hyundai finds a way to improve that IIHS crash-test result, the Santa Fe Sport will make an excellent choice in a crossover SUV. 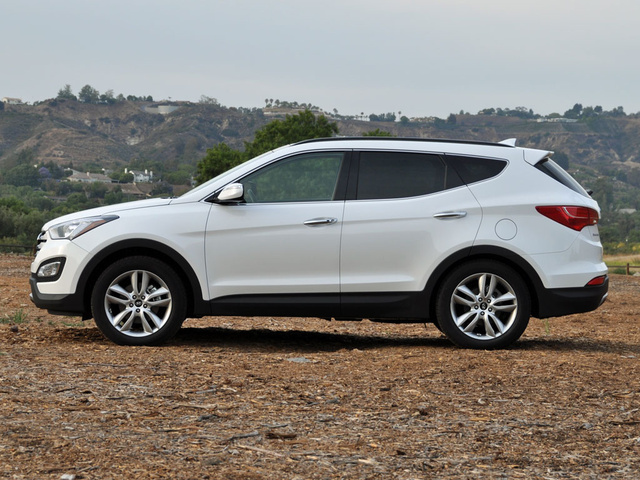 What's your take on the 2015 Hyundai Santa Fe? Users ranked 2015 Hyundai Santa Fe against other cars which they drove/owned. Each ranking was based on 9 categories. Here is the summary of top rankings. 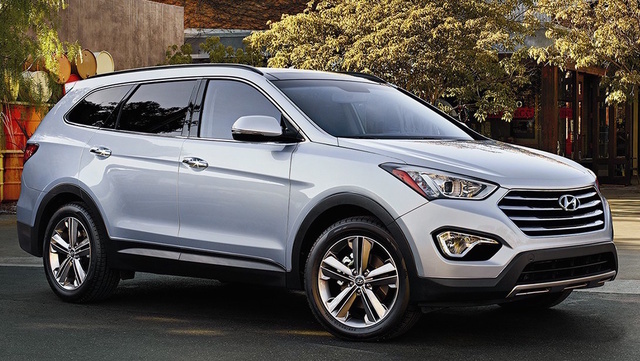 Have you driven a 2015 Hyundai Santa Fe? 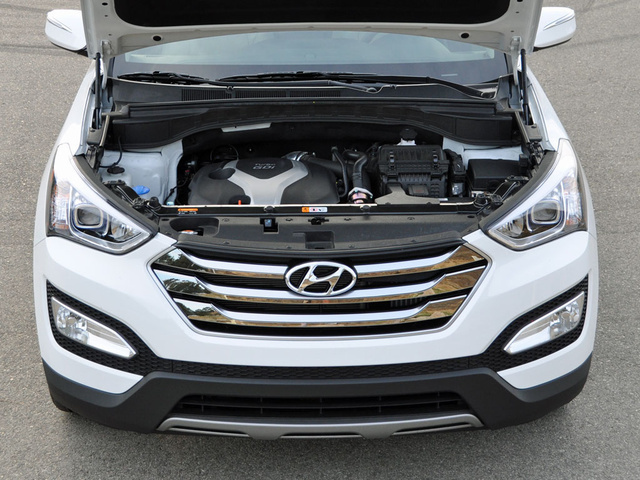 While driving my 2015 Hyundai Santa Fe engine cut off. No warning at all, put it in park and it started up again. What could this be? What causes this? Which Is Larger - SantaFe Body Or Tucson Body Model? 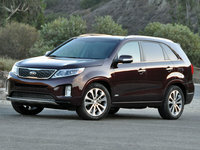 Which is larger - SantaFe Sport of Tucson Sport? My ESC, DBC, and ABS warning lights all illuminated at the same time this morning. Does the 2015 2.0T have a timing belt or timing chain?